Crew neck tees. Pullover sweaters. Button up shirts. These basic variations of tops are great staples to have in your closet, but what about when you need something that strays from the ordinary? A tunic could be exactly what you’re looking for. Comfort and style are two of our priorities at Christopher and Banks, and they come together perfectly just below our long sleeve tunics. These shirts are distinguished by their long hemline, which sits at the hip for a flattering cut that works for any woman’s figure. Wear one to work, on an evening out or during a casual weekend – whenever you need something stylish and sophisticated. Our wrinkle free tunics are a great option for the professional setting. Unlike many button up shirts that need to be repeatedly pressed, ours are made with wrinkle resistant fabric so looking great can be as effortless as possible. The tunic hem also makes it look crisp without having to tuck in your shirt. Wear one under a pullover sweater, letting the collar, cuffs and hem show underneath. This is a great way to stay warm and add flair to otherwise everyday work attire. The bold patterns like animal prints or colorful abstract fabric designs are found on a variety of our long sleeve tunics as well. These, paired with interesting necklines, like the cowl neck or half button placket can turn a standard top into one suitable for fun evenings out or more formal events. They look especially chic when worn with leggings or tapered pants that balance out the shirt’s flowing looseness with more structure on the bottom. Having a few different styles of shirts in your closet will help you mix and match different outfits for any kind of event. 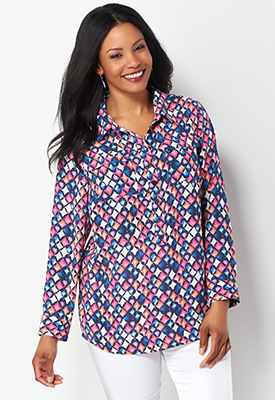 Browse our collection at Christopher and Banks for long sleeve tunics that fit your life.